Creating a finished recording of your music is a process that can be both fun and frustrating at times. Solo artists, producers, and bands write and perform the music, but once it has been recorded getting it to sound “radio ready” can seem like an impossible task. Large recording studios tend to be priced out of the budget for smaller or lesser known artists/producers. Still, a professional mixdown can put your music over the top, allowing all the elements to blend together without overpowering each other or sounding muddy. CinePost offers audio mixing as one of our core audio services. We employ trained engineers with years of experience working on a range of styles from rap & hip-hop to rock, metal, jazz, and electronic dance music. If you have a finished piece of music then our audio mixing services will help your material stand out and sound its best. A dedicated engineer will take your multi-track audio files and load them into a digital audio workstation. Each separate track will be analyzed and the whole song will be listened to critically. From there our engineer will devise a customized plan of attack and make all the necessary tweaks to get your song ready for mastering. We balance each track relative to the others, we apply equalization and compression to help voices and instruments sit properly mix, and we check details like phase alignment and timing. We craft a 3-Dimensional sonic space designed so that the listener can focus on enjoying the music instead of being distracted by problems with the mix. CinePost is a small facility based just outside Atlanta, GA. With only a handful of employees we are able to keep costs low. 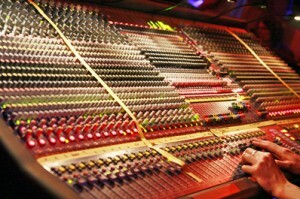 Our audio mixing services start at $75 for songs up to 5 minutes with no more than 32 tracks. This includes a basic mixdown, equalization, compression, and some automation if needed. We can handle songs with 64-128 tracks and longer than 5 minutes, typically we bill $50/hr for more complicated sessions. We also offer vocal auto-tuning and advanced automation to compensate for wild variations and recording problems. No project is too big or small! We’ve done work for dance music record labels and also work on non-musical projects such as recorded speeches or live recordings. Contact us to discuss your individual needs and get an estimate today!